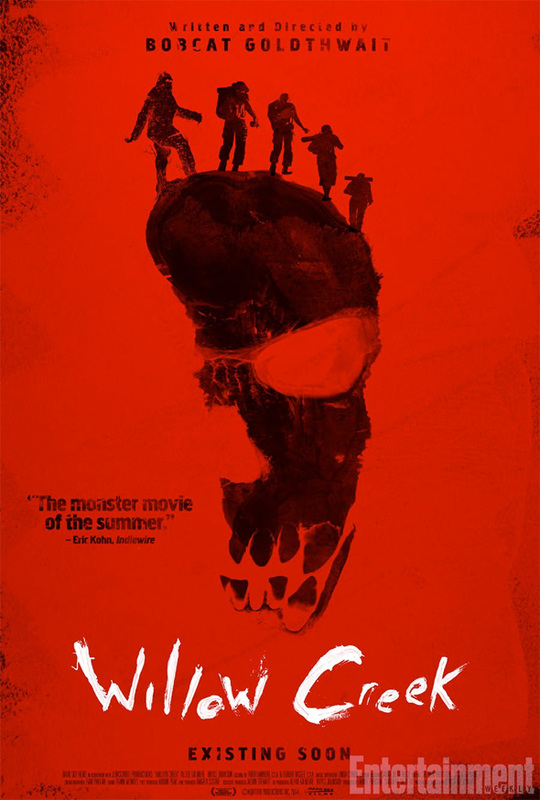 It's been nearly a year since we saw a trailer and a wild poster for the horror film Willow Creek from comedian turned filmmaker Bobcat Goldthwait, and the film is finally coming to limited theaters and VOD this summer. The found footage film has been described as The Blair-Squatch Project since it follows a bigfoot believer who heads into California’s Six Rivers National Forest in order to finally capture footage of the infamous Bigfoot. Now we get another trailer hyping the release next month, and there's also a cool new poster that cleverly uses the footprint of the possibly mythical creature. This looks pretty fun. Watch now! Willow Creek is written and directed by Bobcat Goldthwait (Shakes the Clown, World's Greatest Dad, God Bless America). Jim (Bryce Johnson) and his girlfriend Kelly (Alexie Gilmore) are in Willow Creek, California, to retrace the steps of Bigfoot researchers Patterson and Gimlin, who, in 1967, recorded the most famous film of the legendary monster. Kelly is a skeptic, along for the ride to spend time with her boyfriend between acting gigs. Jim, a believer, hopes to capture footage of his own, so his camera is constantly rolling. The film premiered at the Independent Film Festival in Boston and hits VOD & limited theaters June 6th. I'm pumped. Bobcat is nuts. Loves me some bobcat. Go back to straight up comedy! Bring back Shakes! Existing soon? Lol yeah totally watching this....even though I don't like this director. Damn this looked pretty good! Gotta check it out.